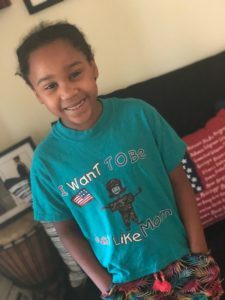 This mid-week as we celebrated Independence Day – kid 3 of 4 adamantly wanted to wear this shirt. I would not normally post her face here but I wanted you to see her glee. My heart swelled with pride because she noticed. Seeing all of this…she still wants this as an option and I am so proud that it is and continues to be one for her. I say this for those with or without kids to say – they are watching you…those mentees, nieces,nephews, god-children, church babies, the pet-sitter and the little boys and girls at lemonade stands…they see you and what you do. You have and continue to provide them options. I am fortunate to see the possibilities of the future before us in my home..
← How do you share you care?